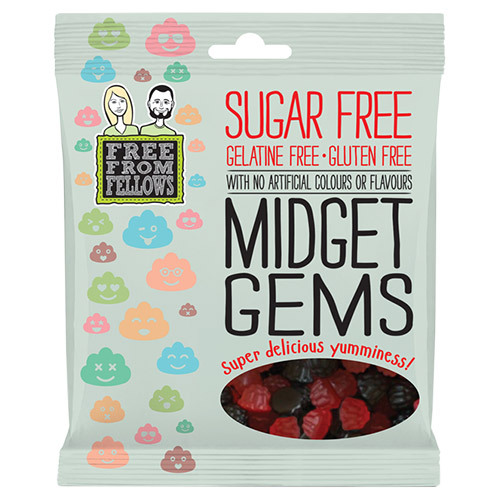 These gem shaped sweets are Free From Fellows` take on an all-time classic. Made without sugar or gelatine, making them suitable for both vegans and vegetarians. Free From Fellows don`t just make super delicious, mouth wateringly unique tasty sweets. They make them without any sugar, gelatine, gluten and no artificial colours or flavours to bring you the best of the best. Sweetener: maltitol syrup; maize starch, water, acid: citric acid, natural flavourings, vegetable oil (coconut & rapeseed), glazing agent: carnauba wax; colours: vegetable carbon, black carrot juice concentrate; sweetener: steviol glycosides. 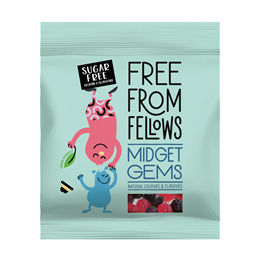 Below are reviews of Free From Fellows Midget Gems - 100g - Best before date is 30th April 2019 by bodykind customers. If you have tried this product we'd love to hear what you think so please leave a review. Good to see there are more gelatin-free sweets available these days. As a vegetarian, I usually have to go without the chewy sweet treat such as midget gems and wine gums, etc which always seem to have bovine in them. I avoid eating absolutely any animal product, but often this means being denied most sweets too. Thank you, Free From Fellows for understanding that vegetarians also like a chewy sweet! These midget gems are gorgeously juicy and chewy!